A hairdressing scissor set is a widely known to be a good purchase option, frequently combining all the tools you need in one stylish case. 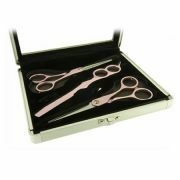 Hairdressing Scissors, Thinning Scissors and sometimes Hair Razors are often included in these sets in matching cases and styles. Great for a mobile hairdresser, these scissor sets also make an excellent present for budding hairdressing students and future barbers; furthermore, they can sometimes be a way of gaining a potential cost saving over purchasing each item individually. Many scissor brands offer their products both individually and in these stylish hairdressing scissor sets which are often colour co-ordinated with other items in that range. To discuss any of these products with us, please call us on 01270 630280. Our office hours are Monday to Friday, 9am to 5pm or Friday, 9am to 3pm. Our help team will be happy to give you advice and assistance.